Balancing between corporate life, travel life and a household with two young boys – Ansoo strives to manage all quarters. Ansoo Gupta is the COO of Pinstorm – a digital marketing firm. She has travelled to almost 70 countries and has founded One Shoe Trust for Responsible & Mindful Travels to raise awareness about environment issues climate change amongst the travellers. Her specialised workshops canhelp women plan their own travels by understanding travel hacks like finding cheap air fares, last minute deals, and even the best way to travel with kids amongst other things. 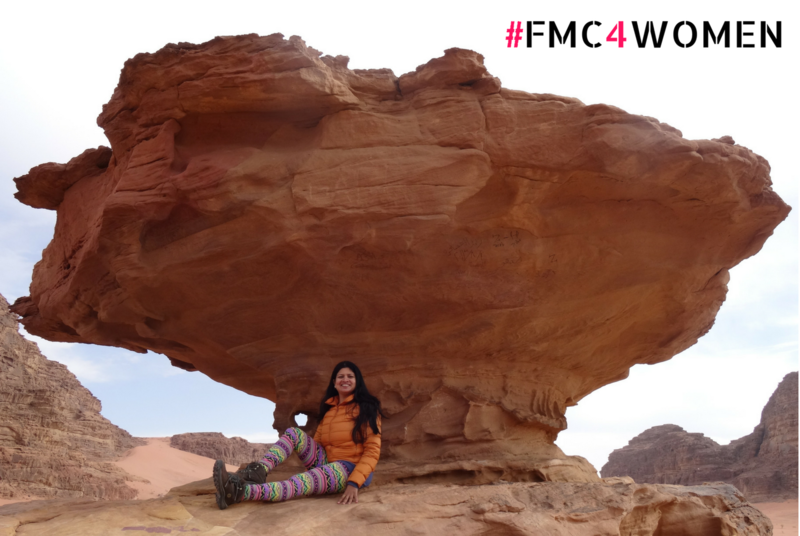 She’s giving us FMC Moms a few pointers about travelling solo. Even the most prolific of women travellers feel a certain hesitation to set out on the road after we become mothers. When the baby is very small, most women would think it is unimaginable to travel and leave the baby behind. What with their breastfeeding, sleeping, pooping routines – only a mother can take care of that. When the baby grows up a little, then he/she is too small and it is almost an emotional crime to leave them behind. Then, when the baby is a young person of 6 – 12 years then he/she is in his/her formative years and you want to them to go wherever you are going and they also want to come with you. And then they turn into teenagers, they don’t want to travel with you anymore. By that time, you have forgotten how to travel alone. Then they grow up some more and get on with their adult lives. By then, if, like me, you had your first child in mid-thirties, then you are in your fifties already and it gets tougher to head out for new adventures. Not impossible, but tougher, specially if your body starts showing your age. Do we really need to wait for our children to grow up before we can reclaim our dreams of exploring far-flung corners of the world? The battle is 98% won if your partner understands and supports your need to take that trip. The co-parent can fill in for you and take extra care of the child for a few days that you are out. A supportive partner will also help you deflect any naysayers who will give you hundreds of reasons why you shouldn’t go and travelling isn’t as important as taking care of your child. These days you can Facetime with your family back home as much and as often as you want. Make use of technologies like CCTVs , Skype, Whatsapp Video Calls, Google Duo, etc. Teach your maid and your child how to make and answer your Skype/Video calls. Children as young as 6 can start handling this simple operation if taught. It takes a village to raise a child. These days we don’t live in villages, we live in high-rises and gated communities. When you are going to be away, inform your closest neighbours and the support staff of the building. These are the people who are nearest and can take quickest action when needed. Instruct the maids / caretakers on what should be the emergency contacts if a situation arises. Don’t beat yourself thinking that you are being a bad mother by leaving your child behind to travel. Firstly, travel is not without purpose – it is something that you feel is necessary for yourself. Perhaps more important than a trip to a day spa or a salon. Secondly, the confidence and inner strength that you will develop by travelling alone is going to come right back and benefit all the members of your family. When you have left your young kids alone at home, make sure that you are making most of your time away from them. Choose a vacation that achieves more than just being a break for you. Learn a new skill when you travel or participate in a volunteering opportunity at your destination. This will elevate your experience and also give you a higher purpose for your travel. Prepare your child for your holiday. Tell them where you are going, why you can’t take them and what will you be doing there. Talk about all eventualities and what they should do in a certain situation. Kids understand more than we give them credit for. If they sulk, don’t allow it. Help them understand that just like they go for their parties and outings, similarly you are going too. It is unreasonable for them to expect you to always stay at home for them. Make your travel interesting for them too. Involve them in your research. And instead of bringing back chocolates or toys, bring back stories, local souvenirs that they can use, or books they can read about that place. Most people tend to think of travel as leisure activity like clubbing. In reality, the right kind of travel is hard work and is a very educational experience. Would you feel guilty if you had to leave your baby behind and go appear for an exam to finish a long-pursued course ? Perhaps not. Why should travel be any different? Mother’s Day is around the corner and we could not pass up an opportunity to talk about the most important women in our lives! We all know mothers are the most sacrificing, multi-talented people on earth that are responsible for our existence here! Mothers are often our biggest source of inspiration. As we inch closer to taking that role ourselves, we wonder what kind of moms will we be? Sometimes, out of sheer love and maternal protection, we stereotype mothers as overwhelmingly cautious. Understandably, there is an explanation and a counter to this misrepresentation. Today we are in conversation with Ansoo Gupta, who is a familiar supermom and she shares her tips and experience of bringing up children. She has been in the media industry for 20 years working with brands like Star TV, National Geographic Channel, The History Channel etc. She is currently the COO of India’s largest digital marketing firm Pinstorm. Ansoo has also traveled to over 60 countries and as her passion project, she conducts travel workshops all over the country to help people design a travelling lifestyle for themselves. Here, she talks about her experience of rearing her two kids from age 0 to 6 and from observing a large number of 18 – 24 year olds who come to her travel workshops and unfortunately are still treated as kids by their parents! Often, mothers are depicted with crippled fear who hold back children from diving too deep, driving too fast or even hilariously chide for never wearing enough layers in the winter! For Ansoo though, each instance is an opportunity to introduce the child to a new world and instill courage and awe of the world around us. She gives us two examples from her life where she motivated her children to go forth and challenge their own limits! Mom-sized love.. built to last! Wasn’t she worried if her little one will be alright? Don’t make them too comfy or too protected! Treat them like adults. Yes, they might get bored in museums but hit a balance. Make a deal with them. Sometimes parents will do kiddy stuff and sometimes kids will do big-people stuff. Encourage questioning and exploration of everything! Parents tends to take holidays as a time to go to relax and pamper themselves. How did travel change for you after you had kids? The big change after I started travelling with growing kids is how I have to look at everything from their perspective and even the things that I took for granted and never noticed, I have to now answer questions about them. So in a way, I have become more aware and intelligent now. In our air-conditioned lives, how do you ensure your kids embrace the outdoors? I want him to see and love this world more than my love for him. I actually do not use the AC in their rooms, till it is so hot that even a breeze from an open window can’t cool. I try to maintain very optimum conditions in my house and always encourage them to learn to bear heat, cold and sometimes even hunger if we are far from a eating place. I encourage them to look after their health, hygiene and safety themselves as much as possible for a 5-year old child. My 3-year old is still young to practice everything but he also doesn’t have it all easy for him.! Even though there’s adequate help available, I encourage them to do their tasks themselves instead of calling out for the maid or us to do everything for them. There’s a fine line between ensuring safety and being adventurous. Any advice to new parents on how they can strike a balance? 1. We, specially modern Indian parents, hugely underestimate our children. In the process we stifle their growth. Parents make the mistake of thinking that they know it all and have this grand responsibility of safeguarding their child from every hardship and pamper them with the best of everything that they can provide for their child! I appreciate this parenting instinct but to be honest it serves the parents’ self-ego more than doing any good for child. Sure enough, protect the child and provide for the child, but within a limit. It is only human’s evolutionary traits that a child still learns how to walk otherwise the parents’ constant refrain of ‘will fall…will fall..’ will never let the child take even a few. 2. There’s a famous saying that how many sweaters a child wears depends on how cold the mother is feeling. That kind of sums up how parents project their own insecurities on to their children. Separate your child from yourself ( this can be very difficult but it is very important) and treat him / her as age -appropriate. Treating the child age-appropriate is easier said than done. Parent’s favorite line is ‘children will always remain young ones for parents’ is very loving and cute but can limit growth of both parties. In my workshops, I have even had 20 – 25 year olds quibbling that their parents don’t let them travel alone and I always remind them that at 18, law thinks you are responsible enough to change the government of a country if it is not functioning properly. So that’s the level you should be at. But the caveat is that the kids have to be responsible. But how can they become independent and responsible when their parents won’t give them a chance. So it’s a chicken-and-egg and I encourage parents to take first steps here and err on the side of assuming that their child will take care of himself / herself. 3. That said, never push your child to do everything that you always dreamt of doing yourself. It is ok to suggest, encourage, facilitate or even egg towards it – but not pushing. Specially when it comes to adventure activities or that require physical or mental strain – please go with the suggestion of local guides and activity specialists. If the skiing instructor says , please note that there is an IF, that your 4 year old is not ready to ski – then hold your horses. Or parasailing etc etc. Remember, preparation for adventure begins at home so keep your child physically active and ‘adventure-friendly’ at home too not just on a holiday. You wear so many hats at the moment, do you still get the time to travel solo? How do you ensure you still have some ‘me’ time? On a day-to-day basis, what really works for me is that I am an early-riser and love the mornings. As is usual in the whole society today, everybody else in my family likes to sleep an hour or two extra in the morning. So everyday I get my me time without any interruptions! As for travelling solo, there are many opportunities because of my work and other commitments, I started travelling, going for movies and meals etc alone very early in my career – as soon as I realized that it is becoming difficult for friends, family, couples, partners to co-ordinate for everything. So this ‘travelling solo’ comes effortlessly to me and actually I encourage it in my travel workshops. Even if you have no dearth of company, still make time for a solo trip every year or two to a totally new place. It stretches your mind and consciousness to new levels! It’s a very very long list!! I have recently launched One Shoe Trust to raise awareness about Responsible and Mindful Travelling, Climate Change and Conservation so there’s work going on that front. I am working on growing vegetables in my tiny balcony – that takes a lot of patience, learning and experience. Then there are always books to read, skills to learn, movies and TV series to see and countries to go to. And then there are kids with a new day and I learn from them so much every day! For Ansoo, children are a source of inspiration and must train to sustain that enthusiasm even into adulthood. They are the best travellers and explorers. Better than adults. They are curious. They are not afraid and make friends with everyone they fancy. There’s no child who doesn’t like to travel. They don’t care about food, temperature, sleeping, waking time. It’s the parents who make their kids behave in a certain way and then quip that the child is too delicate or inexperienced! This Mother’s Day, break all stereotypes and jump in with your kid for some knee jerking adventure! And if you have similar experiences or your mother is the reason for your itchy passionate ventures, let us know in the comment section!